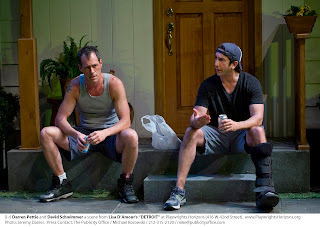 The changing times, the lack of a feeling of "community" in the present-day suburbs and the dangers of keeping secrets are the underlying themes in Lisa D'Amour's dramatic comedy Detroit. Ben (David Schwimmer) and wife Mary (Amy Ryan) are a moderately well-off couple, living in a suburban community while trying to deal with a recent downturn in their economic situation. Ben has been laid off from his job and is working feverishly on starting his own website to launch his new business; while Mary, currently the sole breadwinner, supports Ben wholeheartedly in his new endeavor. Or so she says. 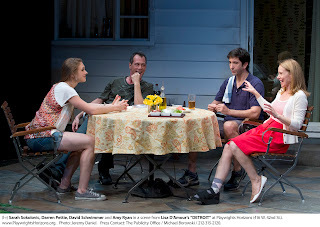 The two have also recently met their new neighbors: Sharon (Sarah Sokolovic) and Kenny (Darren Pettie). A somewhat less refined duo who work menial jobs and are struggling with drug and alcohol addiction. Sharon and Kenny met in rehab and got married soon after. Once they finished their substance abuse programs, the two moved into a house owned by Kenny's uncle Frank (John Cullum). The two couples make for an interesting study in contrasts. Ben and Mary being the more guarded of the two, while Sharon and Kenny are of the "let it all hang out" variety. They decided early on that due to their past problems, they should have no secrets, not only from each other, but also from the world at large. Sharon in particular has a habit of going off on rants, especially about everybody being so busy with their own lives, that they have no time for becoming involved with anyone else, even if the people in question live right next door. In an attempt to prove her wrong, Ben and Mary accept an invitation to come over for dinner, though Kenny and Sharon's food and home is definitely of a somewhat lower tier than Ben and Mary's. The characters, while not feeling all that real at times, can nonetheless be quite interesting. Particularly with the relationship that develops between Mary and Sharon. In Sharon, Mary finds someone to tell her worries to, while Sharon offers some candid and brutally honest comments about Mary's own situation, as well as her own. Their husbands also do a bit of bonding, but in their case it's more of the stereotypical male variety, which entails them drinking beers, talking about women and planning for a boys' night out. However, even as Kenny and Sharon struggle to stay on the straight and narrow, Ben and Mary are dealing with their own repressed feelings and secrets, ones which finally come bursting out in a wild barbeque that ends in a literal blaze of alcohol and sober realization. The underlying strength of the play is that the story itself is so involving, dealing with subjects both topical and universal - people struggling with addiction, the need to achieve success and/or maintain a style of living with which they've become accustomed, and the need to change one's situation and start anew. There are a few plot holes here and there, such as the initially somewhat self-centered Ben and Mary actually agreeing to come over to Sharon and Kenny's for dinner out of a sense of guilt, something that doesn't quite seem in their nature; and can anyone remember a wild party in the suburbs where someone didn't complain about the noise? 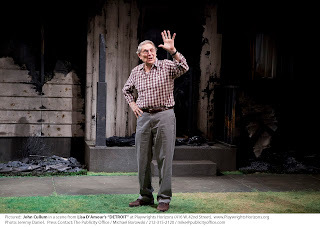 But other than these few little narrative hiccups, the play works well enough, making its points powerfully and succinctly, rather than being overly broad or preachy. As mentioned above, the characters are interesting, though not as fully drawn as they could be. Sokolovic is extremely good as Sharon, a young woman trying to hold on to her sobriety and home as best she can, while seeing in Mary the close friend she's never had. Pettie works well as Kenny, though the character has an excessively hard-nosed attitude, making one feel he's always ready to explode, thus removing much of his sympathy. Schwimmer is fine as Ben, but the character is too much of a cipher, spouting the words and playing a role, but never explaining what drives him or what he wants in life until the very end. By which time, it's really too late to care about him all that much. Ryan is quite good as the long-suffering Mary, her scenes with Sokolovic providing much of the dramatic meat of the play. John Cullum is fine as Frank, appearing only briefly, but his time on stage is pivotal to the story, as he flawlessly delivers a somewhat wistful monologue which takes things full circle and explains much of the back story not previously revealed. Anne Kauffman's direction of the play is fine, though the pacing is a bit off here and there, the show moving sometimes slower than it should. The piece also feels a bit long at points, with about 10 minutes that could have been cut from the running time. Sets by Louisa Thompson are fine and the lighting by Mark Barton, as well as the various effects, all work well. Detroit does have a few problems, but the soul of the show is enjoyable to behold, with its ultimate meaning having a powerful impact. That being how, despite everyone's best efforts and intentions, the more things change, the more they ultimately stay almost exactly the same – in terms of a mental, if not always physical perception.